What happens when we gradually fit more and more everyday objects with sensors? What happens when that sensor is no longer limited to the computer in our pocket and is fitted to our cars, the cars sensor could communicate alerts about ice on the road, obstacles or any other eventuality. If we also coordinate all these sensor readings, we add the possibility, for example, of obtaining the best and most accurate meteorological maps at any given time. We could also create maps in real time, for example, of the parking spaces available in a city, or further improve arrival time estimates. If we feed sensor readings to other sensors, such as homes or the internet of things we are building, the possibilities mind blowing. If you have sensors in a building, you could report many things such water usage, gas usage, electricity usage and Co2 usage. We are not that far away from having sensors everywhere, recently I got a sensor installed in a smart meter for my house. Not far from my house, there is a building that already on the outside are showing in real time what consumption is taking place in the building, I especially like the Co2 number. For us to understand the future, we need to dream… imagine all the possibilities of all those sensors located in objects everywhere: a society that offers us a constant stream of data about what is going on around us. Just imagine what we can create from that data? Is there anything left to be imagined? 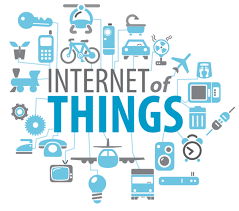 From a tech perspective, I really like the expansion of the possibilities of internet of things, I concerned at the same time. Who owns the data, how should see the data, were is the data stored, how to you secure sensors, how do you make sure that the sensor is not getting hacked. I also have concern that we turn into a surveillance society and the data from sensors in used the wrong way, I could get a call or more likely a sms from my water company, that I used my quota and will not get any water before next month, that would be scary or you get your electricity or gas cut off as you used your quota. What if you have implanted sensors in your body, small tiny sensors that manage your body, who owns your body data, how has control of it, we could become humans robots controlled by a few. What are your thoughts, feel free to comment below.